Photo by Tara Mulhern Davidson. SK PCAP has developed an interactive, hands-on learning opportunity for Grade 10 classes in Saskatchewan entitled Adopt a Rancher. The program has been integrated in schools across Saskatchewan very successfully and is NOW AVAILABLE across the province in 2019! 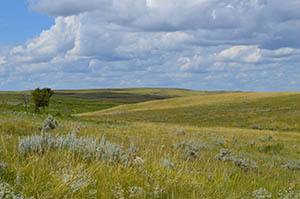 The native grassland ecosystems of Saskatchewan are threatened. The great herds of bison that thundered across the prairie are gone. Bison evolved with the grasses, forming a close relationship in which their health depended on each other. 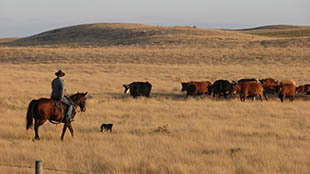 Today ranchers manage native grasslands to keep them healthy, using livestock in place of bison. Making the right management choices means that native grasslands can be a sustainable resource for Saskatchewan in which the biodiversity of native species is protected. Grasslands have other values and functions that are important for society such as regulating water flow and maintaining soil stability. Students in the Adopt a Rancher program analyze a ranch ecosystem in a case study that they develop themselves. By using a student guide and online resources and communicating with the adopted rancher, students will answer this question: How can ranching protect Saskatchewan’s native grasslands while providing economic benefits for Saskatchewan people? Part 1: The Adopt a Rancher program coordinator meets with the rancher in the summer or fall prior to the school’s involvement in the program. The tentative areas for activities are selected for the May or June Field Day. Safety issues or other concerns are discussed. The rancher and the coordinator take pictures for the Rancher’s Portfolio which students will use to study the ranch ecosystem and to become familiar with the ranch. The rancher fills out the Ranch Profile to provide information about the land and its management. Part 2: The second part takes place when the Grade 10 Sustainability of Ecosystems Science unit is taught—allowing flexibility for the teachers. Components of the Adopt a Rancher program support learning objectives in the Sustainability of Ecosystems unit so teachers know their students are covering the needed material as they develop their case studies. Part 3: A date for a Field Day will be set. Groups of students collect data for projects they have designed as they tour the ranch. A picnic lunch and group games round out the day. Part 4: After Field Day, students complete their case studies and participate in a class discussion examining the sustainability of the ranch ecosystem. *NEW* Adopt a Rancher Guides are now available in French. Please contact pcap@sasktel.net if you are interested in French programming.